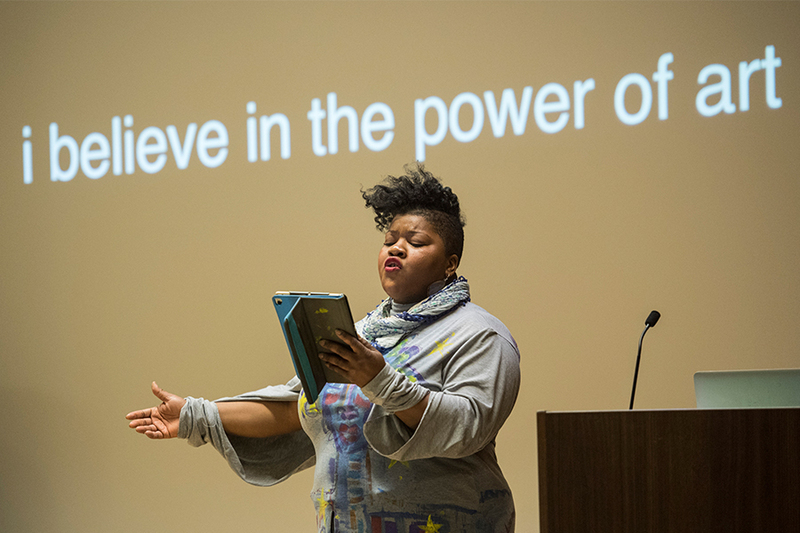 Artists, community activists and scholars working on “The Black Question” in Paris and in Pittsburgh came together for events on the the effects of globalization, modern citizenship and rising nationalism on black communities. Organized by Mame-Fatou Niang, assistant professor of French and Francophone Studies in the Dietrich College of Humanities and Social Sciences, the events included the photo exhibit “Black, Muslim and French,” the Pittsburgh premiere of the film “Mariannes Noires: Afropean Mosaics,” which is a second iteration of the Dietrich College Honors Fellowship thesis from Kaytie Nielsen (DC’16), and the symposium “Blackness, Citizenship and the Arts.” The symposium featured four panels which compared and contrasted the multiple layers of blackness, its realizations and challenges, as well as the ways in which the humanities and art help rethink and redesign new identity paradigms. Pictured above: Citizen artist Vanessa German at Blackness, Citizenship and the Arts.